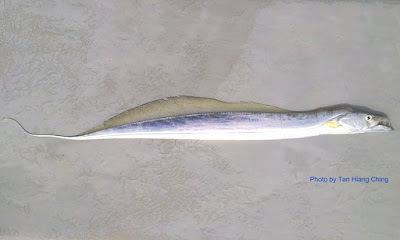 Hairtails, cutlassfishes, scabbardfishes and frostfishes are the common names for the members of the Trichiuridae family. The family members are characterized by their ribbon-like, extremely elongate and strongly compressed body. Their dorsal fin is very long, extending over length of body. Their caudal fin is tapered to a point, or very small and forked. Members of the Trichiuridae are found in the tropical to warm-temperate waters of Atlantic, Indian, and Pacific oceans. There are 10 genera and about 46 species worldwide. They can be found from the surface to a depth of about 2000 m. They have extremely strong and fang-like teeth. They are known to be voracious predators, feeding on fishes, squids, and crustaceans. Size: Maximum standard length 225 cm. 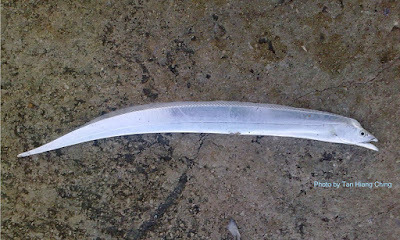 Size: Maximum total length 234 cm, commonly between 50 and 100 cm.